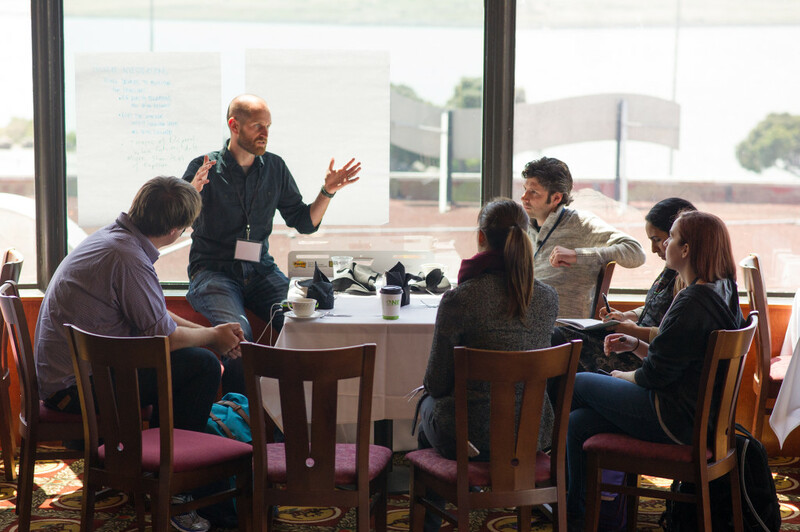 At TechRaking: Elevating the News in Berkeley, California, attendees got a demonstration of drone technology in action and discussed creative ways to integrate the machines into journalistic efforts. As drone technology accelerates, so too does the public’s exposure to the machines. They draw praise and pointed criticism for their use in military operations. They’ve been employed to deliver coffee and drop contraband over prison walls. In the coming years, they just might replace your postman. They are, and will continue to be, a steady presence in the news industry. But for many media organizations, such ubiquity raises a conundrum: What role should they play in actually reporting the news itself? That was the question a group of more than 100 journalists and technologists sought to answer April 22 at TechRaking: Elevating the News, hosted at Golden Gate Fields in Berkeley, California. The event – a collaboration of The Center for Investigative Reporting, the News Lab at Google and Stanford University’s John S. Knight Journalism Fellowship program – examined how drone technology can affect and assist journalists as they explore new reporting frontiers. The first step is understanding the laws, said Mickey Osterreicher, general counsel for the National Press Photographers Association. Flying a drone for commercial purposes – including journalism – currently violates Federal Aviation Administration regulations. Before reporters can use drones, the federal government must lift or tweak its blanket ban. It’s unclear how long such a development would take, and Osterreicher isn’t holding his breath. Still, drone developers such as 3D Robotics CEO Chris Anderson are optimistic. In “a golden age of personal storytelling,” the government ought to be nudged toward action by the sheer prevalence of drone technologies, he said. The machines, for all their legal challenges, afford unprecedented autonomy. Lawmakers should recognize that as an opportunity, not a barrier, he said. “What would you do if you didn’t have to be an operator, but instead a participant in your story?” he asked. Attendees soon had a chance to find out. 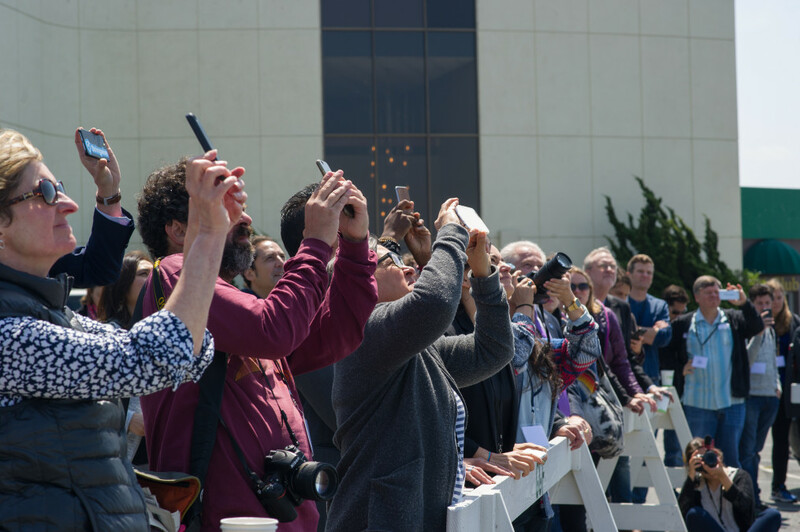 In one of Golden Gate Fields’ parking lots, Eric Cheng, director of aerial imaging for the technology company DJI, conducted a demonstration of his Inspire 1 and Phantom 3 drones for the assembled crowd. As the machines buzzed and dipped, he listed their applications: agricultural mapping, aerial photography, weather monitoring. To demonstrate one machine’s camera and flying capabilities, he snapped a “dronie” – a drone-produced selfie – of the eventgoers. The afternoon centered on a design sprint in which participants broke into teams to brainstorm ideas about how to implement drone technology in the newsroom. One group, Open Sky, was led by Kenyan journalist Dickens Olewe. After an hour of ideation, the team proposed a coalition in Nairobi, with support from Nairobi University, to challenge the country’s ban on journalists’ use of drones. Another team, LiteBrite, led by Julian March of NBC News, suggested using drones as a means of surveying populations; those who wanted to vote for a law or initiative would signal a drone with a beacon of light or color. A third group, Free and Clear, proposed a Flickr-style repository for Creative Commons drone photography and videos. While TechRaking sparked a robust conversation about drones and journalism, ideas about how to use them will remain just that – ideas – until the machines are legalized. Such uncertainty is part of the TechRaking process, said Joaquin Alvarado, CIR’s CEO. Innovation starts with inquiry. Correction: A previous version of this story misidentified the leader of the LiteBrite team. The team’s leader was Julian March.